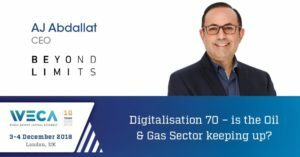 AJ Abdallat Executive Interview: Digitalization – Is the Oil & Gas Sector keeping up? Can you tell us about your journey that ended up in CEO of Beyond Limits? I started in 1998 working with Caltech, which manages the Jet Propulsion Laboratory (JPL), which is a NASA center. We wanted to commercialize technologies that were developed for the space program, including smart sensors and artificial intelligence. Since then, I have founded several companies to bring innovative NASA/JPL space technology to market, the latest of which is Beyond Limits, which was launched in 2014 and focuses on Artificial Intelligence, specifically human-like reasoning. The AI solutions developed by Beyond Limits magnify human talent, enabling people to apply their attention, experience, and their passions to solving problems that truly matter. We focus on solving big problems for large scale industries that touch millions of people. In energy, we’re partnering with a giant energy production company. We’re trying to help them increase and expand all production with mature subsurface reservoirs. Ultimately the goal is to provide a cognitive ability, so they can understand where to drill next. This technology is going to lower the cost of production. It’s going to make oil and gas less expensive. It’s going to help everyone. What, in your view, has been the key to Beyond Limits’ success? Our approach goes beyond conventional AI by bringing human-like reasoning and cognitive reasoning to the equation and by explaining the rationale and evidence behind the recommended course of action. Conventional AI systems are what we refer to as black box implementations, where systems are trained based on data, but cannot explain how they got the answer. At Beyond Limits we can explain how we got the answer because our systems provide an audit trail that justifies the rationale and provides evidence for the answer. Beyond Limits’ cognitive Intelligence has strong roots in bio-inspired algorithms, which mimics the functions of the human brain. Our systems are both educated and trained using captured data. But unlike most of the competition, our systems are also educated by facts, situational awareness, and human knowledge. This means we can solve problems that neural nets cannot, especially when the data is sparse or unreliable. Digitalisation has been a hot topic for many years but seems to have lower penetration in the oil and gas industry versus other industries – do you agree or disagree with this statement and why? Oil and gas companies were pioneers in leveraging the first digital age in 1980’s making use of seismic analysis to boost operational efficiencies. Unfortunately, they have not fully taken advantage of the second digital revolution. Digital readiness will be a key factor for organization to take advantage of advancement in technologies and AI to significantly boost productivity and performance. Companies that will make their organization more digital will have a huge advantage. What can the Oil & Gas industry and those that finance, and invest in, the industry learn from other industries that you have worked in? Beyond Limits is used to dealing with space where even when things go wrong, or data is missing, you need systems that can think through the situation and come up with a solution, so the mission can continue. For Oil & Gas explorers with remote installations in the North Sea, the Arctic circle, or in the middle of the desert, circumstances are similarly unpredictable. AI has been used to develop and advance numerous fields and industries, but we need to go beyond conventional AI in industries such as Oil & Gas exploration where there could be sparse or unreliable data. Cognitive intelligence goes beyond conventional AI by bringing human-like reasoning and cognitive reasoning to the equation. Industries like Oil & Gas should be using cognitive intelligence like Beyond Limits solutions which utilize human knowledge to learn context and meaning so they can make good recommendations to people for faster, better, decision-making that reduces risk and lowers production costs. What will the market’s best performing companies of tomorrow look like? The best performing companies of tomorrow will embrace digitalization. Gartner predicts AI will create 2.3 million jobs by 2020. The question is no longer whether AI will fundamentally change the workplace. It’s happening. The true question is how companies can successfully use technologies and AI in ways that enables the human workforce, helping to make humans faster, more efficient and more productive.